We discovered something interesting during my class on Sunday last weekend. The pattern requires that you work with standard fat quarters as you will be cutting 4 blocks from each at 9 inches square. 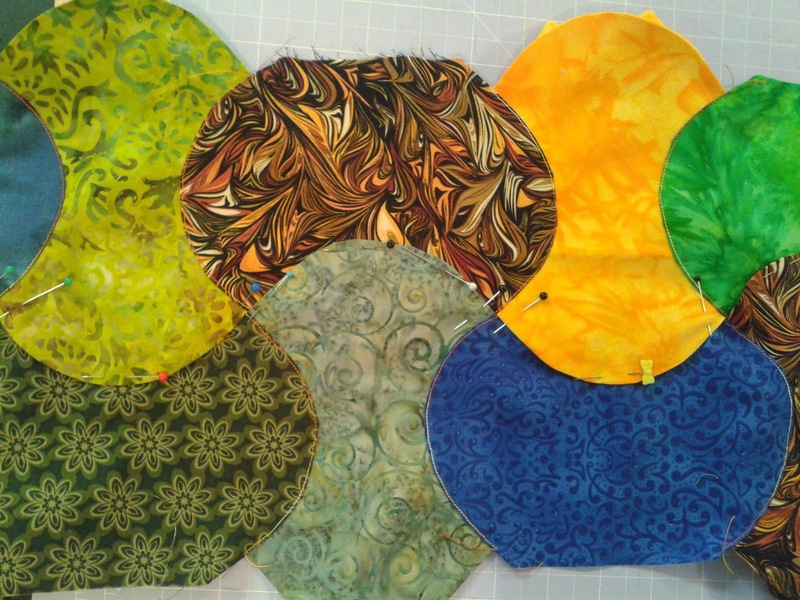 A number of ladies had issues with one or more of their pre-cut FQs being ever so slightly too small to work with. It turns out that almost all of the FQs were purchased from the same store in town and I worked out what has happened. In New Zealand (and over in Australia) despite us quilters usually working in inches, fabric is sold by the metre. Our FQs reflect this, so are usually approx 50cm x 55cm (around 22" x 24" for the Americans!). An American FQ is a wee bit smaller at 18" x 24" as they sell fabric by the yard. It seems that we have one shop that is selling their pre-cuts in American sizes. Now there is nothing wrong with that in principle (it's certainly one way to improve your profit margins on pre-cuts), but it makes it very awkward when they are a little bit canny about not warning their customers! Using patterns that have been written locally assumes a certain sized FQ and you can easily find yourself short enough fabric! Not a great way to inspire customer loyalty. The major bug-bear I had with it was that when we measured some of them to see if with careful cutting we could still use them, several of the dodgy FQs measured at only 17.5"! On another note, I am currently trying to construct my borders on me shhh-secret-squirrel project and I'm loving how it looks. Lets just hope it fits onto the centre piece properly! Cheaty freezer-paper, starch, and top-stitching. No curved seams! !